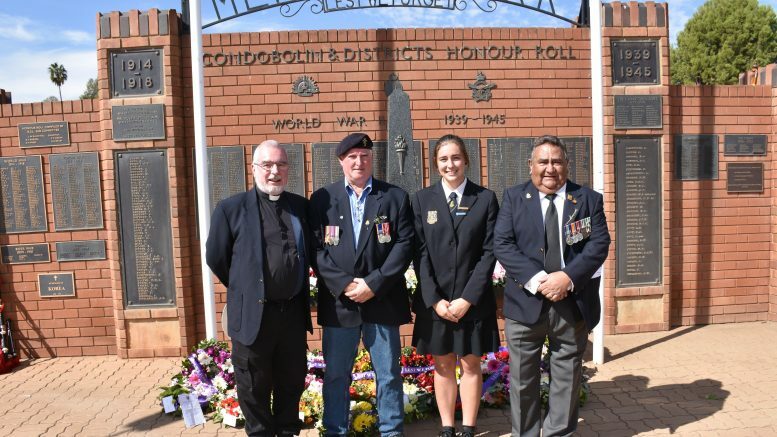 A large crowd gathered to commemorate Anzac Day in Condobolin last Wednesday. The day began with a traditional Dawn Service at Memorial Park, with many taking the opportunity to remember all those who have served and continue to serve, as morning broke over the town. A brilliant day greeted all those who participated in the March, many of which were children from local schools. Vintage Cars led the procession, making their way down Bathurst Street, then on to the Cenotaph at Memorial Park. The service began with the laying of the wreaths, with servicemen and women, service clubs, local organisations, school and community members, paying their respects. President of the Condobolin RSL Sub Branch Michael Wighton, recited a Prologue at the Service. “We are assembled here to commemorate that immortal day when the young men of Australia by their deed and sacrifice demonstrated to the world at Gallipoli that Australia was truly a Nation. The sons and daughters of ANZACS and Australians came forward without question, accepted gladly and discharged fully their responsibilities during World War I, World War II, Korea, Malaya, Borneo, Vietnam, East Timor, Iraq, Afghanistan and various peace keeping operations throughout the world,” he stated. “On this day we remember the sacrifice of such men for an ideal, for a way of life. “Let us take strength in the knowledge and hope that our sons and daughters will never forget the example set by their forefathers. In our everyday life let us endeavour to carry on those traditions established in past wars and conflicts at such tragic cost. “We think of every man, woman and child, who in those crucial years, died so that the lights of freedom and humanity might continue to shine. We nurture to, the obligation of showing gratitude for the peace we enjoy and the responsibility of ensuring that the freedom and liberty so costly won is not lost by our indifference.